I'll start off the festivities on this Friday with a reminder of two upcoming local events. This Sunday, I'll be speaking at the Delaware Celiac Support Group meeting in Newark and will have product samples. The event is at Christiana Hospital (Room 1000) beginning at 3 p.m. You can RSVP at this link. Tickets are still available for Celiac Awareness Night at the Phillies game on Wednesday, July 7. I will be volunteering at the information table on the 200 Level for part of the evening, so if you're attending please stop by and say hello. A new gluten-free beer was the subject of a post this week. Estrella Damm Daura from Spain is now being imported into the United States, with Pennsylvania among the first states to have access to it. The novelty of the beer is that it's made with barley malt that is removed during the production process, bringing the level of detectable gluten to less than 6 parts per million. Lots of news - and notes, of course - to get to this week. La Locanda in Edgmont (4989 West Chester Pike, 610-353-7033) has gluten-free pasta, while its neighboring take-out place (5003 West Chester Pike, 610-325-5200) has pizza from Still Riding. In Media, American restaurant Generations (9 State Road, 610-565-8212) now notes gluten-free items on its dinner menu. Reader Jamie let me know about two places she and her family have eaten at with success: New American Tango in Bryn Mawr (39 Morris Avenue, 610-526-9500), which is working on producing a dedicated menu, and Haverford's Du Jour (379 Lancaster Avenue, 610-896-5944). Two weeks ago, I mentioned that Modo Mio, in the Northern Liberties section of Philadelphia, has gluten-free pasta. Co-owner Peter McAndrews also runs sandwich shop Paesano's across the street (152 West Girard Avenue, 267-886-9556) and at the Italian Market (901 Christian Street, 215-922-9220), both of which will have gluten-free bread available for sandwiches beginning next week, according to the Inquirer's Michael Klein. In Center City, 10 Arts at the Ritz-Carlton (10 Avenue of the Arts, 215-523-8273) can accommodate gluten-free diners. Pastry chef Monica Glass, who has celiac disease, tells me that several of her desserts are or can be modified to be gluten free. In Wilmington's Little Italy, Ristorante Attilio (1900 Lancaster Avenue, 302-428-0909) now offers gluten-free pasta. Also in Wilmington, Thai restaurant Soybean Asian Grill (4702 Limestone Road, 302-636-0800) uses gluten-free soy sauce and all noodle dishes are made with rice noodles. Thanks to reader Tammy for this news. Steakhouse Seasons 52, in King of Prussia and Cherry Hill, posted its Summer 2010 gluten-free menu. Fleming's Prime Steakhouse & Wine Bar, locally in Radnor and Marlton, has new items on its Summer menu. Safe for those on gluten-free diets are the Lump Crab Louis Cups appetizer, Porcini Rubbed Filet Mignon (no cream sauce), Peppercorn Steak and the Salmon Nicoise Salad. In more brew news, the Side Bar in West Chester and Chickie's & Pete's South Philly location (thanks Mark) carry Redbridge, while the Sidecar Bar & Grille - also in South Philadelphia - has Lakefront New Grist beer and Doc's Apple Cider. 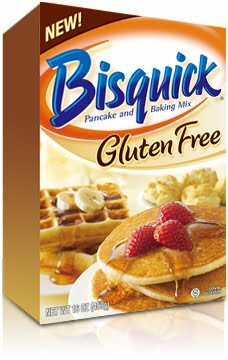 Back in April, I shared the news that General Mills will be producing a gluten-free version of Bisquick starting this summer. Well, summer is now here and the mix will soon follow. In anticipation, the company has posted many recipes calling for the mix, including strawberry shortcake and biscuits. (Thanks to Kim of Gluten Free is Life for the link.) Nutritionally, a 1/3 cup serving of the new mix, which is made in Canada, has less fat (0.5 grams) and sodium than even the low-fat version of wheat-laden Bisquick. The ingredients are rice flour, sugar, leavening (mainly baking soda), modified potato starch, salt and xanthan gum. General Mills, which has been progressive in introducing gluten-free products, has a website listing all of its safe products, including Nature Valley Almond Crunch and Peanut Crunch bars. A tip of the hat to reader Leslie, who shared that website with me. Whole Foods Gluten Free Bakehouse's two newest products are 12 oz. round cakes in vanilla and chocolate flavors. New animal cracker-style cookies are out from Ian's Natural Foods. I'm not a fan of the Ian's products generally, although there are a couple of exceptions. Perhaps this one will pleasantly surprise me. So there you have it. I hope everyone has a great weekend!